When Daniel was a baby I sank into new-motherhood, finding every day completely taken up with caring for the demanding little creature that Daniel was. I felt like I got nothing accomplished. Eventually I started keeping a "Done" list (as opposed to a "To Do" list.) At the end of the day I would write down everything I had accomplished. For instance, "unpacked and reloaded dishwasher, did a load of laundry, read to Daniel, mailed two parcels, made dinner," etc. It made me realise I was getting more done than I'd thought. Once I hit my groove and more responsibilities came along I reverted back to regular To Do lists out of necessity. But the stupid, stubbornly perfectionistic side of me always felt that a To Do list was a completable thing. I thought that I would write my list, then cross each item off it as I did it, and then - ta-da! The list was done. Silly me. You can imagine my frustration and sense of failure at never actually completing my To Do list. I've finally reached the point where I realise how fluid and ever-evolving a To Do list actually is. 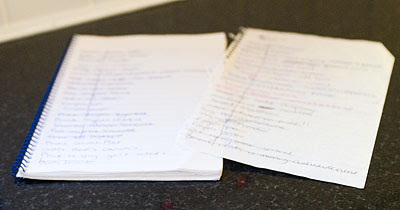 I currently employ a spiral-bound notebook, adding items to the list as needed, and crossing them off when completed. It helps me to remember everything and to keep my focus. And it actually serves the purpose of both a Done list, when I look back over all of the items I've crossed off, and my original (flawed) vision of a To Do list, when I complete both sides of a page and rip it out and throw it into recycling.